As every New Yorker knows, the city’s aging subway system is terribly congested and unreliable. New technology can dramatically increase both the capacity and reliability of the subways, but the pace at which the MTA adopts technological innovations is glacial. Wi-Fi in stations wasn’t made available until 2017, years after other cities. Our refusal to embrace fare-collection technology or to acquire a more state-of-the-art train signalling system also has us behind the times. And driverless or even single-driver trains still seem light years away. Even if it is more difficult to upgrade old systems than build new ones, the MTA must accelerate the adoption of new technology to meet the needs of a growing ridership. Growing subway ridership is straining the system and exposing the negative effects of decades of underinvestment and lack of innovation at the MTA. Subway performance has declined steadily over the past three years, causing stress and aggravation for riders. Technology has the potential to improve capacity and reliability, but the MTA is dreadfully slow at adopting innovation. Signal-related problems account for well over half of all subway delays. Upgrading to the more efficient Communications-Based Train Control (CBTC) signaling system would be the single best way to increase capacity and improve reliability on the subway system in a relatively short amount of time. And yet, the MTA continues to adopt CBTC at a slow pace. Since 1999, when the agency began upgrading signals, only the L line has fully implemented CBTC, with the #7 line coming on in 2018. It could be 50 years before CBTC is installed throughout the system. Other technological innovations are also progressing very slowly. Subway stations only just acquired Wi-Fi and cell service in 2017—years after other metro systems. The magnetic Metrocard has kept fare collection stuck in the 1990s, despite cities all over the world having adopted “tap” technology long ago. Driverless subways—or at least subways with only one operator instead of two—are within reach, but the MTA has not been capable of taking that leap. The New York City subways are old, and upgrading such systems is harder than building new ones. But other cities, including Paris and London, whose systems are at least as old as ours, are adopting technology to improve capacity, reliability, and customer satisfaction. Just as technology is transforming all different aspects of modern life, it can—and should—transform the way public transportation is operated. Dynamic information about crowding conditions, events, incidents, and current train locations can and should make more efficient use of the infrastructure that is already in place and inform passengers in real time. Modernizing our subway technology could shave precious minutes off the average commute, while also improving reliability and resiliency—two of the most crucial drivers of the region’s success and prosperity. Using radio signals, fiber optic lines, and advanced computer software, Communications-Based Train Control allows each train to know precisely where it is relative to the train in front of it so they can run more closely together. This real-time information about each train's locations can be shared with customers so they can make more informed decisions about their travel choices. Overall, CBTC lowers maintenance costs, improves efficiency, and when hurricanes and rising sea levels threaten more frequent flooding, provides more resiliency—because CBTC equipment is either waterproof or relatively easily removed and reinstalled. Simplify the installation of the new signal system. 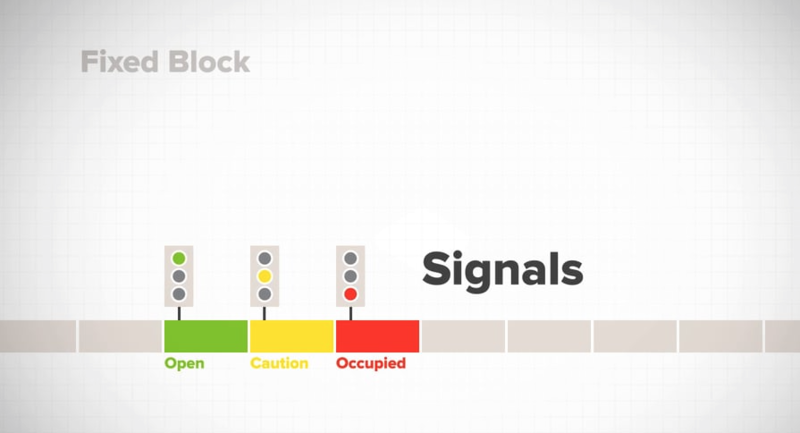 The MTA currently requires the existing fixed-block signaling system to be upgraded and retained as a backup as the new CBTC signals are installed. The MTA should instead simply install CBTC alongside the current fixed-block signaling system and test in the background while the existing system continues to authorize train movements. Once CBTC testing is complete, the old fixed-block system could simply be deactivated and left in place—potentially serving as a backup in case issues arise after the installation—and eventually removed over time. This approach would have the added benefit of limiting the amount of track access required for the installation. Eliminate the legacy analog interlocking equipment. After track-circuits, signals and train stops—the last vestiges of the legacy signaling system— are removed, the agency could use axle counters as a backup to continue tracking and protecting trains. Guarantee track access and extended work windows. Track work is complicated and expensive on a 24/7 system. Closing the subways on weeknights and/or for more extended time periods would create more opportunities for track installation and testing of the equipment—and reduce costs. Only 1.5 percent of weekday riders use the system between 12:30 am and 5 am. The overwhelming majority of people who ride the subway during the daytime would benefit from the better, more reliable, cleaner and better-maintained system that weeknight closures allow. Of course, whenever lines are shut down, the MTA will need make sure that riders are not left stranded. New bus service should be provided to mimic subway service on traffic-free streets, and with shorter waiting times than today's overnight subway service. Accelerate the procurement of new subway cars. The MTA could further accelerate the adoption of CBTC by retiring its oldest train sets early, and assigning specific fleets to specific lines. The 21st century really is delivering on the futuristic technology that we had all imagined—except for transit. Why are we settling for 20th century fixes to our subway system? Wages and benefits account for 40 percent of the cost of operating the subways. As we invest in technology, we must take advantage of the opportunities technology provides to change the responsibilities of MTA’s workers, or potentially reduce the number of those positions through natural attrition at the agency—to lower operating costs and/or redirect savings to infrastructure upgrades. For example, one of the benefits of CBTC is that it is capable of determining the cause of an emergency brake application, allowing the conductor to address the situation more quickly. Yet MTA work rules for the L line have not been revised to reflect this opportunity, requiring conductors to continue the practice of walking the length of the train anyway, which further delays operations. Another example of the MTA being reluctant to change institutional practices is the lack of progress in transitioning to One Person Train Operation (OPTO). With the help of new cameras and CCTV monitors that let train operators at the front of the train view the entire length of the platform, operators (at the front of the train) could close the doors (in the middle of the train), while conductors could be redeployed to stations and other important positions. The MTA should use its next contract negotiation with labor to draft a schedule to start the full conversion of the subway to OPTO over the next five to 10 years. Ultimately, MTA subways should transition to fully automated trains, as evidence shows driverless subways are safer, more energy efficient, and more flexible than human-operated trains—with reduced maintenance costs. Once CBTC is fully installed, the MTA should move to eliminate train operators altogether and operate a driverless subway. Replacing the train operators with technology could save the agency billions of dollars annually in labor costs. Alternatively, the MTA could redeploy operators as roving train agents who are responsible for customer assistance and respond to medical emergencies or crises. As fiber-optic cable is laid, CBTC is adopted, next-generation fare payment systems come online, and stations and trains are equipped to measure performance, occupancy, and the environment, vast amounts of information are being generated that could help the MTA operate the subway very differently than it does now. 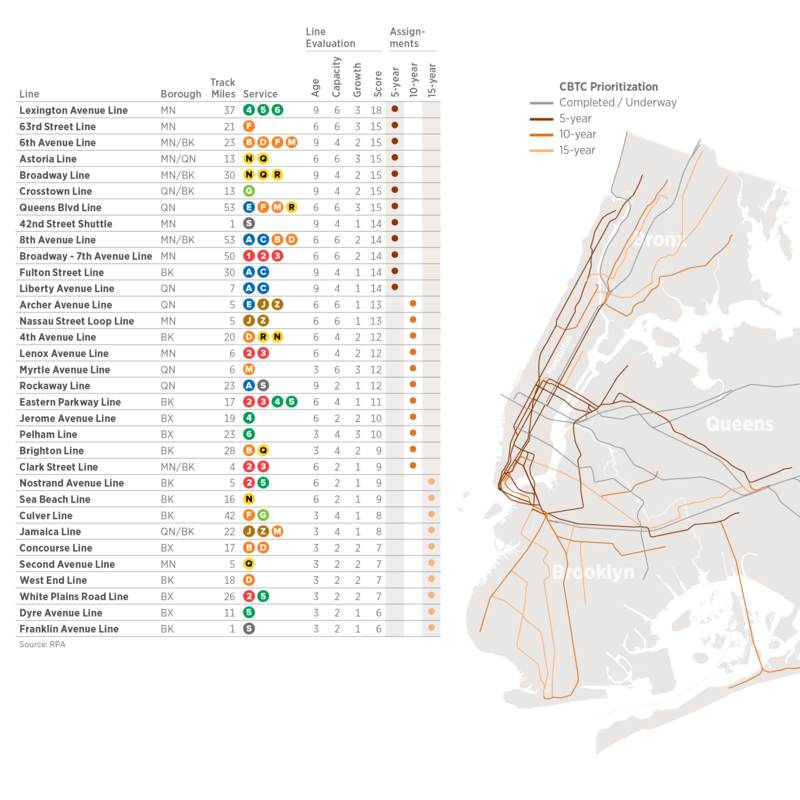 Equipped with this data, the MTA could start piecing together over the next few years a much more complete picture of the operational environment and start sharing it with customers. It isn’t difficult to imagine riders receiving information on their smartphone about delays so they can explore alternatives. Signage in stations should be dynamic, diverting passenger flows to keep people moving during incidents. The MTA should leverage the new contactless fare collection technology to support both fare pricing based on means and dynamic pricing to further encourage passengers to divert to a less-crowded subway line or the bus during events or incidents. Looking farther into the future, one can imagine passengers’ smartphones anticipating travel patterns based on travel history and preferences. When passengers enter a subway station, the MTA could know they are destined for a specific place and customize its trains’ operations based on that demand—thus skipping through stops and adding service when needed. Tying all of these technologies with those coming online in the future will allow the MTA to operate the subways in ways we cannot even completely imagine—but this will happen only if the agency embraces innovation. Modernizing the subway with newer equipment will improve reliability and provide greater redundancy. Modern train control would make the subway safer and increase system capacity, thereby reducing congestion (if paired with other “brick and mortar” investments) and creating space for growth. It would also lower operating and maintenance costs by hundreds of millions of dollars annually. Finally, it would allow the MTA to improve the distribution of employees to better serve customers. RPA estimates that it would cost about $27 billion, or $1.8 billion annually over the 15-year life of the plan, to fully implement CBTC on the subways. This estimate includes the cost of installing the system and upgrading interlockings and other associated investments. These costs could likely be reduced if the implementation of CBTC is streamlined. It’s a very significant investment, and cost is the main reason the technology isn’t being implemented more rapidly. At the current pace, the MTA would take more than 50 years to complete the changeover. RPA proposes accelerating the process, as well as prioritizing major lines so New Yorkers and others can receive the benefits of CBTC sooner.